One of my favorites is just printing out little photos of people and sticking them on their presents. It makes it real easy when you wake up at 6 am (which I do, I am always the first up on Christmas. Another "tradition" I have branded myself with) to hand out the gifts - no reading required. This year I ran across all these little wooden ornaments in my christmas decor that I have accumulated throughout the years. They had been being re-packed away forever so I decided to finally do something with them to avoid repacking them again (or tossing them out). Because I knew painting them to hang on the tree was not going to happen, I have officially been a mother for almost 15 years - I have so been there and done that. So, not getting too creative but changing it up a bit I painted them with chalkboard paint and stuck them on presents for gift tags. This is a "at your own risk" project, obviously the names could be easily rubbed off - to prevent any mix-ups I only put them on presents I knew I could identify if any curious fingers got the best of me. Giving actual step-by-step instructions seems a bit superfluous but I will say I used a couple coats because the wood is so porous and I let them dry for about any hour before I started any ribbon tying or chalk writing. Any pre-holiday traditions you will be engaging in this week? Love both these ideas! LOVE the idea of printing pictures. Might be too late for me this year, but oh, I need to remember it for next...! THANK YOU! Love these! You could always use chalk paint pens to avoid rubbing off! Comes off with water :) I get into traditions too, so your routine sounds totally normal to me! Haha "no reading required". I love that idea. 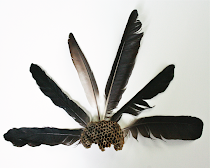 Genius and would spruce up a gift perfectly! What a fun idea! 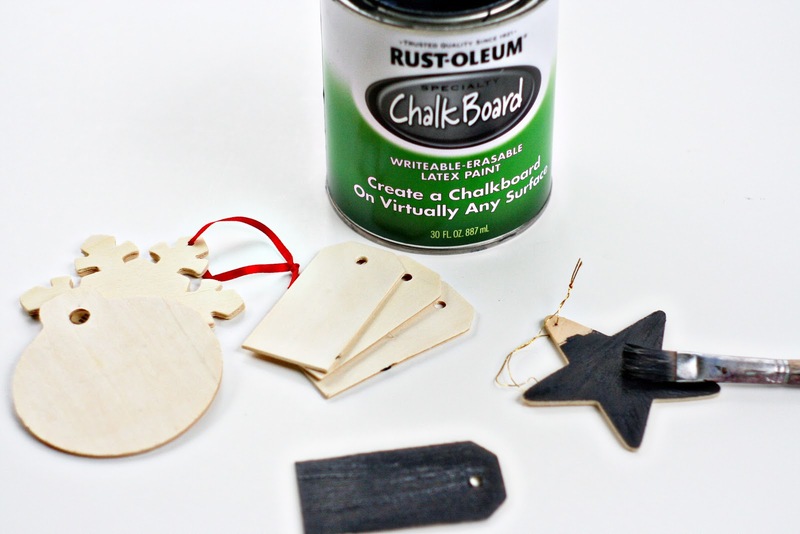 These chalkboard gift tags look absolutely amazing! That's so original and I especially love the bauble one with the glitter - cute idea. And yes, Christmas Vacation is a necessity. That's just non-negotiable! 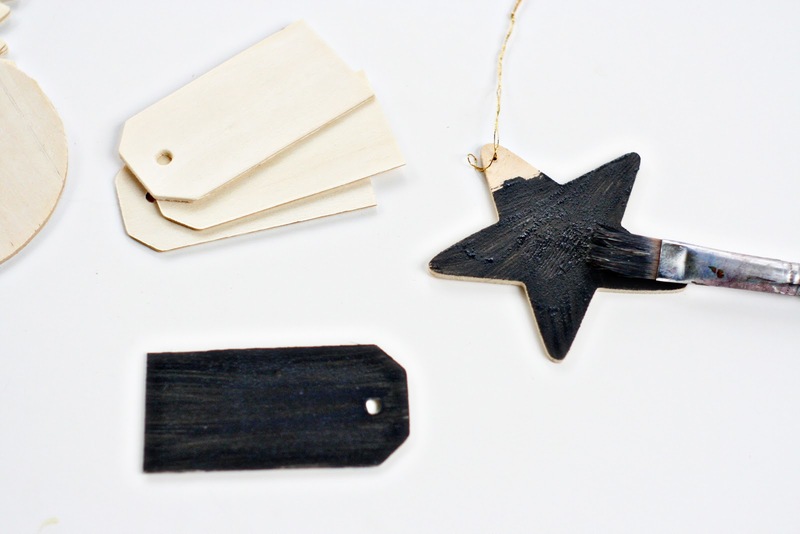 I love that, if the gifts are for those within the house, you can reuse them year after year. 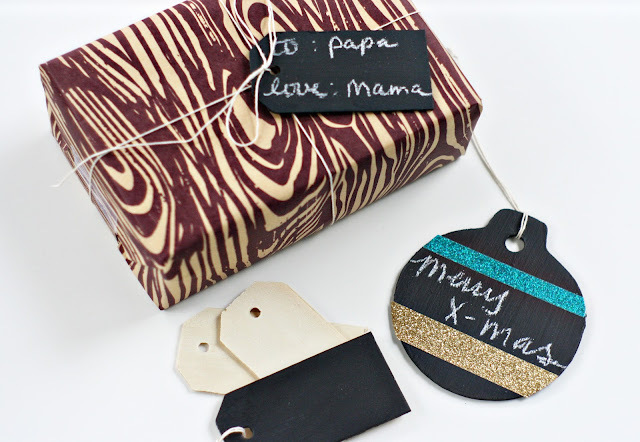 What a great idea for gift tags! I love all things painted with chalkboard paint and this one is no exception. I have to tell you that I also love your idea of printing out people's photos as their name tag - Smart! Hm, holiday traditions? Nothing as cute or fun as yours. I did put up my first advent calendar this year for the kids (thanks for the motivation! ), so I see this becoming something I do year after year. me too, i have painted a pantry door in my kitchen the back of my front door, wasted a bunch and used it on several other projects and i still have a ton left in my little can. i like the advent tradition too, but to be honest we end up doing it about every three days because i am terribly forgetful! WOOOOOOWWWWWW!! !I am impresed! !I love this ideaa!!!! !